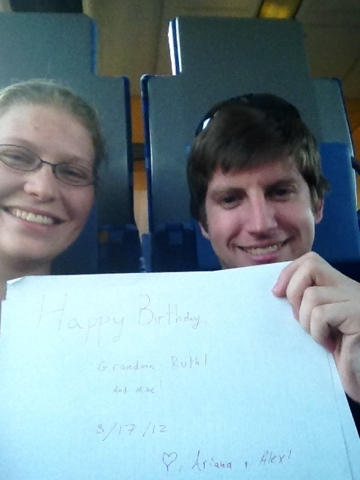 We’re actually stealing Internet from the hotel down the street right now, but I wanted to say a quick happy birthday to Mike and my Grandma Ruth! We are currently in Eger, in the northeast of Budapest. It’s a lovely little town, with a cathedral, castle, and the northernmost medieval minaret in Europe, left over from the Ottoman conquest. Photos to come soon! Such happy smiles! Hope Alex enjoys his visit! Mike was really glad to see that Alex remembered his birthday! Having a St. Patrick’s Day birthday means no one ever forgets it, but given Alex’s finals chaos followed by the quick exit from the country, we thought it might happen. But no!!! Alex, your Dad is very happy you remembered him :). It sounds like you are having a great adventure and Alex doesn’t look too jet-lagged!